Most airline passengers have experienced turbulence or air movement around the aircraft that causes a shaking or sudden jolt of the plane. Turbulence can be caused by changing temperatures, storms, atmospheric pressure, jet streams, and other natural phenomena, and often passes within a few minutes. However, the unpredictable nature of turbulence makes it the most common cause of in-flight injuries. Head injuries. The sudden jerking of the plane during turbulence can cause repeated neck strain or whiplash, and can cause passengers to hit their heads against seat backs and windows. If the overhead compartment doors contain faulty components, luggage may fall onto a passenger’s head during turbulence. Trips and falls. Passengers who are standing or walking in the aisle when turbulence strikes may be thrown forward onto the floor, backward onto a cart, or even collide with another passenger. Turbulence may also cause a passenger moving to or from the restroom to lose her footing, bumping into the sink, walls, or door. Soft tissue injuries. When a sudden change in altitude causes the plane to drop and rise in quick succession, standing passengers may twist their knees and ankles in an effort to stabilize themselves. Broken bones. Turbulence can be so severe it can throw passengers from their seats into the walls and floor of the cabin and may cause food and beverage carts to roll unexpectedly down the aisles, slamming into passengers’ elbows, feet, and hands. Injuries to cabin crew. Hundreds of flight attendants have been the victim of turbulence incidents, many of whom sustained serious or even fatal injuries. Seatbelt misuse. Passengers and flight crew members are much more likely to sustain injuries during turbulence if they are not wearing their seat belts. Under FAA regulations, passengers are required to be seated with their seat belts fastened between leaving the departure gate and takeoff, during landing and taxiing to the arrival gate, and whenever the fasten seat belt sign is turned on during the flight. If the pilot did not turn the fasten seat belt sign on and announce the need to remain buckled before your injury occurred, the airline may be found liable. Improperly stowed items. Flight crews should know how to properly store luggage so that items will not fall into the aisles or roll into passengers even if the plane encounters turbulence. An airline or airline employee may be found negligent if an unsecured object caused a tripping hazard, an unlatched overhead bin popped open during flight, or if items in a pantry or drink cart came loose and struck a passenger. Inadequate safety measures. 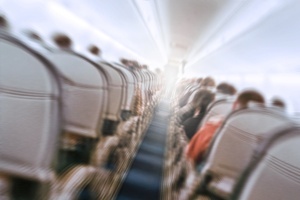 The airline itself might be liable for turbulence injuries if it failed to create or enforce safety measures that could have minimized the likelihood of injury, such as a failure to properly train personnel, create an emergency response policy for in-flight injuries, or fail to update outdated policies that no longer adequately protect passengers. Defective components. Although in-flight injuries may be caused by negligence on the part of an airline, some are the result of defects with the plane or its individual components. For example, a defective latch on an overhead bin may allow items to fall during turbulence even if the latch was operated correctly by cabin crew. In these cases, injured passengers can seek compensation from the manufacturer of the plane or the distributor of the defective part in a product liability claim. Airplane injury cases are often complicated, and it is vital for victims to seek the advice of an experienced aviation attorney to pursue their claims. At GriffithLaw, we conduct a thorough investigation to determine who is responsible for your suffering—and we do not collect any legal fees unless we recover compensation for you. Simply fill out the short contact form on this page to set up your no-cost injury consultation, or learn more about your rights in our free guide, The 10 Worst Mistakes You Can Make With Your Tennessee Injury Case.